Murudeshwar is a popular tourist destination for the beach and the temple. This is a town situated in Bhatkal Taluk of Uttara Kannada district in Karnataka State. The statue of Lord Shiva in Murudeshwar is famous for being the second tallest statue. The Murudeshwar Beach is surrounded by hills with lush green environment and water sports activities on the beach for the enthusiast people. This temple is situated in Kanduka Hill which is surrounded by waters from the Arabian Sea. There is a 20-storied tower built at the temple. 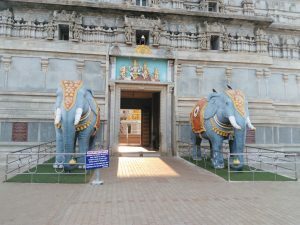 The management of the temple has installed a lift which bestows the aerial view of the 123 feet of Sri Shiva statue from the peak of the Raja Gopura. Devotes can do seva by themselves at the base of the hill where there are Rameshwara linga and built-in cave behind this where you visit with the entry fees. 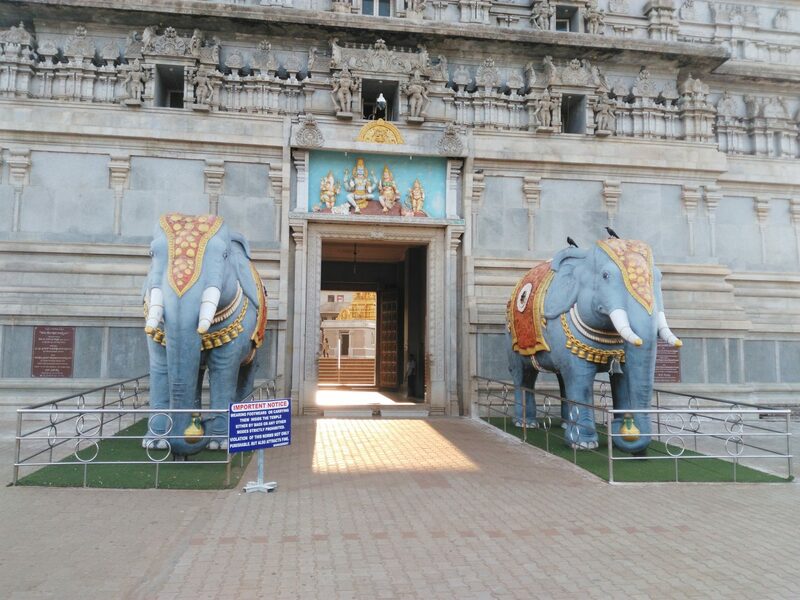 The tourists can visit Shaneswara temple which is next to the Sri Akshayaguna idol. The distance from Bangalore to Murudeshwar is 625 kilometers by road. This takes around 11 hours of bus commute. You can choose buses from KSRTC or private buses. Murudeshwar does have a railway station but very few trains stop here. The best way to travel by train here to go to the nearby Bhatkal Railway station The distance from this railway station to Murudeshwar is just 15 kms. There are plenty of buses plying from Bhatkal to reach Murudeshwar. 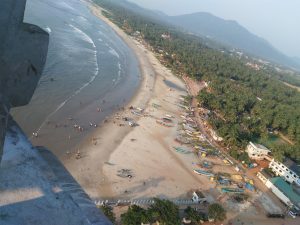 There is no airport in Murudeshwar to reach the destination, so the nearest airport is Mangalore Airport which is 156 kms. Since traveling by air will be very expensive and also time-consuming, so commuting by buses, cars and train will be a suitable option. This place is famous for its scenic view and the temple complexes which attracts devotees and visitors. The sunset over here is mesmerizing which is the pleasant way of relaxing. Best time to visit Murudeshwar is from October to March. Maha Shivaratri is the significant festival celebrated here with a great deal of devotion and spiritual rituals. This place is also well-known for the Murudeshwar Fort and wonderful beaches. 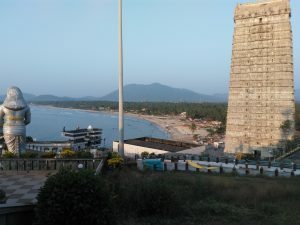 The distance of Netrani Island is 20 km from Murdeshwar. The Netrani Island is also a very famous destination for tourists as it offers superb boating, snorkeling and scuba diving opportunities. Numerous types of coral, butterfly fish, trigger fish, parrot fish, eels and shrimps could be seen here. This is also identified as Netragudo & Pigeon Island. The island is reachable by boat from Bhatkal and Honnavar. The island consists of a ruined temple, a Roman Catholic Church and a mosque. Monday to Sunday: Temple Reopens at 15:00 hours. Monday to Sunday: Temple Darshan 15:00 hours to 20:15 hours. Monday to Sunday: Rudrabhishekam 15:00 hours to 19:00 hours. Temple Closing Time from Monday to Sunday 21:00 hours. There are various hotel accommodations to choose from Murudeshwar. If you need a closer view of the temple and enjoy the mesmerizing view of the sunset and beach, you can choose RNS Residency which is a beachside hotel. Dhenuatithya is located near to the Murudeshwar. This hotel is a vegetarian restaurant and is well maintained with regards to hygiene and ambiance. There are other hotels and homestays available in Murudeshwar. The best time to visit Murudeshwar is from October through February. The preferable time is the winter season where the weather is pleasant and with soothing time to enjoy the beach. Sirsi: The distance from Sirsi To Murudeshwar is 106 km and the travel duration is 2 hours 49 minutes by road. Sirsi is a city in the Uttara Kannada district in the State of Karnataka. There are different places to visit in Sirsi. Banavasi Temple, Marikamba Temple, Unchalli Falls, Sahasralinga, Benne Hole Falls, Burude Falls, Mattighatta Falls, Sodhe Vadiraja Mutt, Topical Rainforest Ecological Camp, Gudavi Bird Sanctuary, Shivaganga Falls. Kukke Subramanya Temple. Shree Kukke Subramanya temple is situated in the village of Subramanya, Karnataka. In this temple, Lord Kartikeya is worshipped as Subramanya. Idagunji Ganapati Temple. Idagunji is a small place in Honnavara taluk, Uttar Kannada district which has the well-known Ganapati temple, this place is also called as Mhatobar Shree Vinayaka Devaru, Idagunji. Mirjan Fort, Near Gokarna. 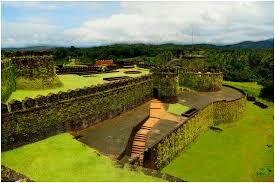 The Mirjan Fort is situated on the West Coast of the Uttara Kannada district in the southern Indian state of Karnataka. 6. Maravanthe Beach. Maravanthe is a beach, village near Kundapura, Karnataka. 7. Koosalli Waterfalls. Koosalli Waterfalls is a huge waterfall situated in a deep and rocky forest near Koosalli village in Karnataka. These waterfalls are also called Kusalli, Abbigudde, Abbigundi, Gudanagundi, and Boorlagundi Falls. 8. Kudumari / Chaktikal Waterfalls. Kudumari Falls is in Kundapura Taluk, Chaktikal village of Udupi district in Karnataka. this waterfall is also known as Belligunndi and Chaktikal waterfall. 9. Tannirbavi Beach. 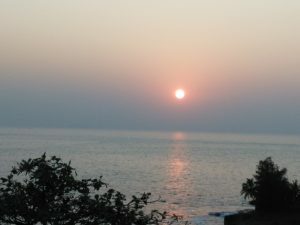 Tannirbhavi beach is located in Mangalore, Karnataka. Tannirbhavi is one of the famous beaches in Mangalore city and is the most visited beaches after the Panambur beach.